WHAT'S THE BEST PRINT ON DEMAND SITE FOR MY T-SHIRT BUSINESS? What’s the Deal with Print-On-Demand? What’s the Best POD Site for My T-Shirt Business? Why Did We Choose These POD Sites? What's the Deal with Print-On-Demand? Since the 2000s when the first Print on Demand sites popped up online, we’ve seen a variety of sites dedicated to bringing together artists and consumers. Artists who have decided to sell tshirts online have discovered that going through this route is way easier than printing their own designs and trying to sell them in the ever growing online t shirt market. We went through the process of ordering t-shirts from five major Print on Demand sites (Teespring, Society6, Threadless, Spreadshirt and Redbubble) and throughout a series of posts we’re going to review and test these shirts to the max. To figure out who has the best custom tshirts we ordered the exact same design on an adult unisex medium shirt and we selected the one each site listed as basic in black. 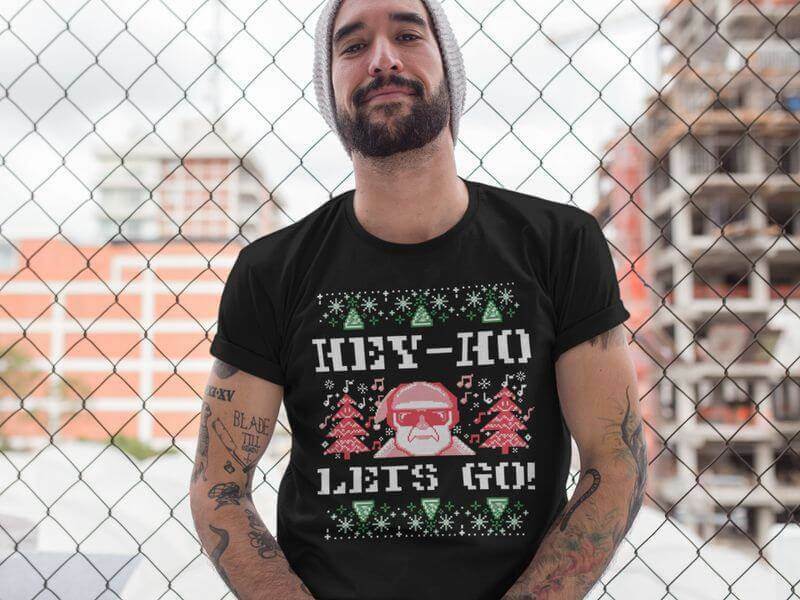 The design we used was created using Placeit’s Ugly Christmas Sweater Template and the tshirts where ordered to look as similar as possible to the one below. We decided to review the largest companies and the ones we had heard more buzz about. We also wanted to include a selection of POD sites that included a variety of audiences. E.g Threadless, Redbubble and Society6’s marketplace falls under more of an artsy category, while Teespring and Spreadshirt have a wider consumer base. 1. Redbubble has to verify your account before uploading your designs, so keep that in mind before using it. 2. 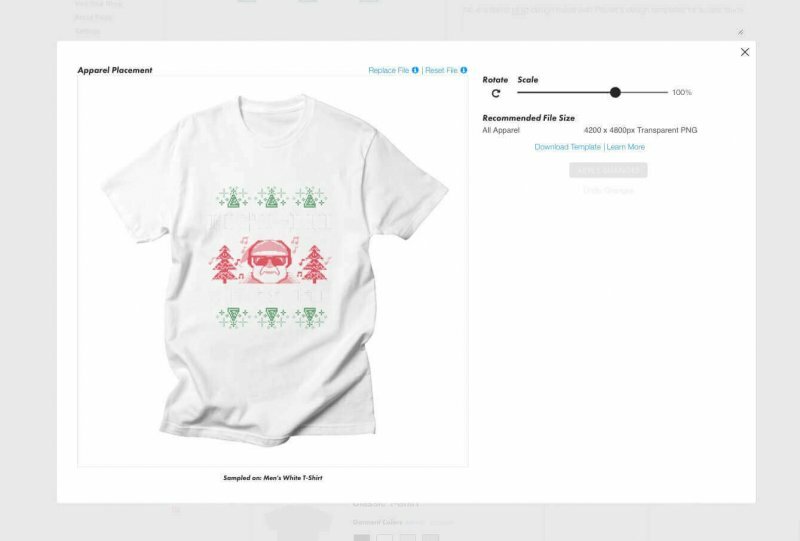 Teespring has two routes you can go through: Create a campaign and wait for it to be funded or use Teespring Direct (the one we used), which lets you upload and buy your design without going through a campaign first. With Spreadshirt we had an issue with the positioning of the design on the garment. The uploader wouldn’t recognize that our design was a transparent PNG file, hence having area without design. The automatic positioning was too small, but when we tried to make it bigger it showed an error saying that we had gone over the printing area. Over on Threadless we had some problems placing our design as well. The t-shirt sample shown to help you place your design correctly is a white tee which made it almost impossible to place our design that had white elements on it. We ended up just ordering it with the automatic placing. Other than those two hitches, the experiences is all of the platforms were seamless and in most of them hassle free. Remember that before uploading you’ll have to have custom t-shirt design (one with a transparent background works best). All of them will ask you for a title for your artwork, so make sure to name it something catchy and descriptive. We ordered our tees on November 8th around noon. 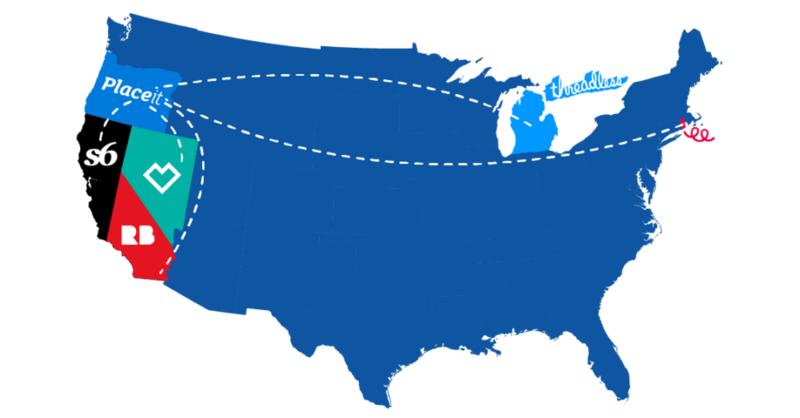 We wanted to record how long tshirts would take to get to us in Oregon. Print on demand sites ship from all over the country: Threadless ships from Michigan, Teespring from Rhode Island, Spreadshirt from Nevada and Society6 and Redbubble from California. Shipping varied grately from POD to POD. The quickest ones were Threadless and Society6 who took only a day to produce and ship our design. Then came Redbubble and Threadless who both took two days. Finally, Teespring took a whooping seven days to produce and ship. 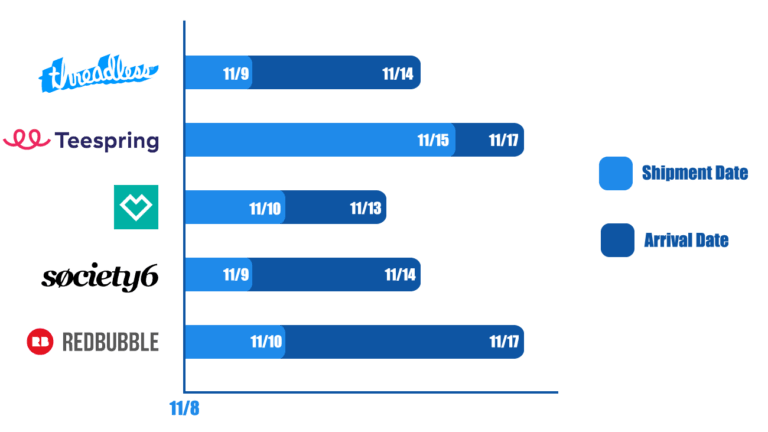 Now, arrival dates varied a ton too. USPS took two days to deliver for Teespring, and three for Spreadshirt even though it’s closer to us. Both Threadless and Redbubble used UPS. They took five days to deliver from Threadless and seven days from Redbubble (even though we’re practically neighbors!). Finally, Society6 used DHL who took five days to deliver. We can’t really dock points off for shipping times, as all of them were well within the estimated times they post on their sites, but it was curious that the closer we were to the shipping site, the longer it seemed to take to get to us. About production times, it was interesting to see how long it took to produce the same shirt, with the same design. When deciding where to print custom tshirts, choose a site where people are happy with the whole process, from ordering to recieving the final product. Another one of the aspects we were interested in checking out was the quality of the package and the state we got it in. All packages came in garment bags made with sturdy plastic. They were all water and tear resistant and looked pretty good when they arrived. Redbubble and Society6 stood out from the rest because their bags were branded. Dying to see what the best print on demand site was? Check our next post in this series, in which we go over the t-shirt unboxing and fit review in our quest to find out what print on demand site has the best custom t-shirts online! Also try our Make a Pillow Mockup with Placeit for inspiration on more products you can sell on your POD business. What's the Best POD Site for My Tshirt Business? Deciding what print on demand site to use to sell your custom t-shirt designs can be a hassle, so the team got together to review which site has the best ordering and shipping process, which one has the best quality tshirts and which one has the best print quality. All to help your tshirt brand stand out from the rest. 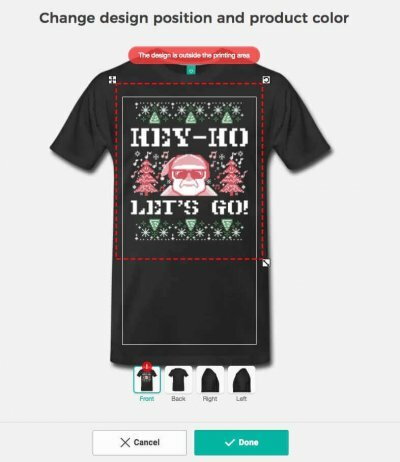 Create a T-Shirt Mockup Now! "My revenue from tshirts has gone way up since using Placeit's mockups"